SAN JOSE, Calif. (KGO) -- The San Jose Sharks have seen a lot of overtime on the ice vs the Las Vegas Golden Knights. Close calls and late goals have kept this series exciting as the two teams vie to continue in the playoffs. Unfortunately for the men in teal, they couldn't get another win as William Karlsson of the Knights scored the goal that beat the Sharks 4-3 in overtime, leading to the Knights' first win on the road in this series. 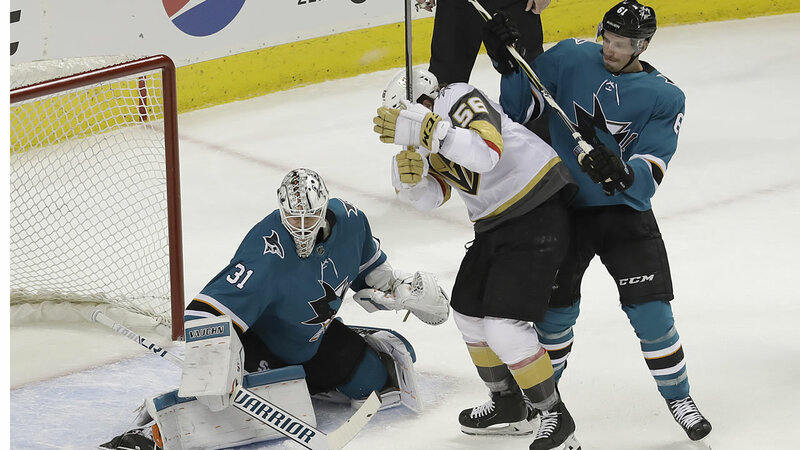 After Tomas Hertl tied the game with 1:57 left in regulation, the expansion Golden Knights rebounded and won despite failing to convert on two early power-play chances. Marc-Andre Fleury made 39 saves, including a brilliant one to rob Logan Couture early in the overtime. Couture had another chance in the sequence before the winning goal. But the Knights broke out with the loose puck and Karlsson beat Martin Jones with a wrist shot high to the stick side and was mobbed by his teammates. The Sharks had a rocky start with the Knights at the beginning of the round when they were clobbered 7-0. But the Sharks came back in the second game, winning 4-3 in a miraculous overtime wrought with tension, reviewed goals, and more action. The Sharks have made consistent playoff appearances in recent history, but it seems a new fire has been lit under the team, a fire that ignites in overtime. The Golden Knights are a fierce hockey team when firing on all cylinders. The Sharks saw that during the first game of the series, but in this third game both teams seemed to have each other figured out. They kept up -- goal for goal -- until the game reached a fever pitch in overtime Monday night. Both teams put up a defensive fight worthy of the Stanley Cup throughout the third period, keeping each other back through penalties and power plays, but it was the Knights who pulled out the overtime goal to give them the win. We've seen that before, as the Sharks and Knights playoff game extended to double overtime on Sunday. Logan Couture scored the winning goal that drove the Sharks over the edge. The Knights lead the series 2-1. Click here for more stories, photos, and video on the San Jose Sharks.